A great design for those wearing Navy, and wanting to glam up with gold accessories. 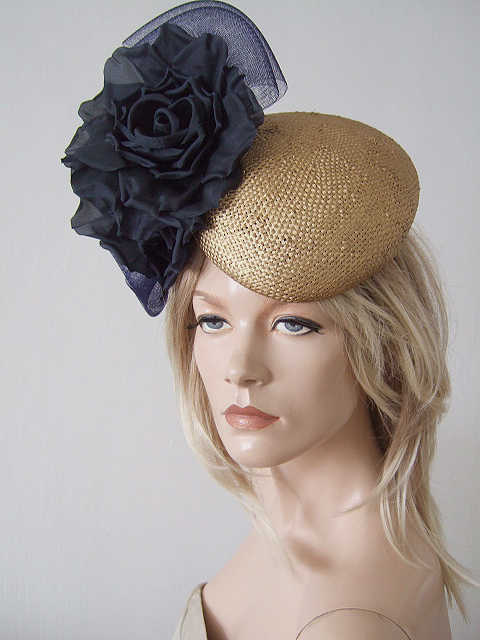 This is a Gold Teardrop Straw Beret, with two large Silk Roses in Navy, and Bows of Navy Crinoline. In 2008, William won the UK-wide Creative 30 competition, set up to discover the UKs most talented creative young people. Following this, he opened his Glasgow city centre studio and showroom in January 2009. William won Accessory Designer of the Year at the Scottish Fashion Awards in both 2010 and 2012. Headpiece sits at an angle with the teardrop beret sitting above left eyebrow, with the Flowers and Crin Bows on the right hand side of head. Attaches by black thin alice band under the headpiece. Beret Measures 7.5" x 6", and floral arrangement height 10".